In 1930, when the Museum of Modern Art was not even a year old, Henri Matisse came to America. The main purpose of his voyage was to visit Albert Barnes and to view the future site of the Dance Mural he had commissioned for his museum in Merion, PA. American collectors, including the four Steins, the Cone sisters of Baltimore, and Barnes, played a crucial role in Matisse’s early career. Indeed American museums own many of the painter’s iconic works. Henri Matisse: The Cut-Outs at MoMA (October 12, 2014-February 10, 2015) will be a long-remembered exhibition. The works on view include the restored Swimming Pool, which the artist created for his dining room when age and disease limited his ability to get about. Indeed this joyous show includes several of such environments the artists created for himself. I particularly liked The Parakeet and the Mermaid filled with leaves, fruit and a small bird with which the painter identified. Taken as a whole, the show is a tour de force of Matisse’s sense of color, design and technical skill. It all looks so simple! It is also particularly nice to experience these marvels during the darkest days of the year. Henri Matisse’s Dance mural, created for Albert Barnes. One of the delights of the Cut-Out exhibition are Matisse’s stained glass windows. In 1952 he created The Christmas Window for Life magazine. It is now owned by MoMA. Its bright yellow star, colored leaves and background translate the magnificence of this world-wide holiday. Abby Rockefeller died in 1948. Even though her friend Henri Matisse himself was aged and infirm, the Rockefeller family asked him to create a rose window for the small Union Chapel in Pocantico Hills, NY where they often worshipped when at Kykuit. At first Matisse refused because he was unfamiliar with the site, but he finally consented. A long exchange of letter and sketches followed between Matisse and Alfred Barr, MoMA’s director, who handled the commission. When Nelson Rockefeller read of the artist’s death on November 3, 1954, he figured that there would be no window. A few days later a letter, dated November 1, arrived. It stated that Matisse had happily concluded his work. 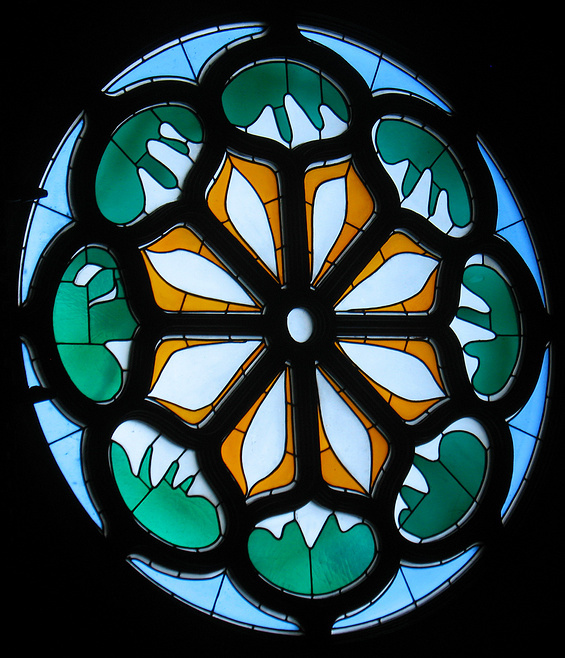 The maquette for the rose window, created by Matisse’s cut-out technique, was found tacked to the wall of Matisse’s bedroom. The window was completed in France. Its delicately shaped glass petals, surrounded by two concentric circles of free-form yellow and blue-green glass, are part of America’s Matisse treasures. For more details see Suzanne Loebl’s America’s Medicis: The Rockefellers and Their Astonishing Cultural Legacy (Harper, 2010). This entry was posted in Uncategorized and tagged abby aldrich rockefeller, albert barnes, alfred barr, art, art exhibits, art museums, barnes, barnes foundation, dance mural, henri matisse, john d. rockefeller jr, kykuit, matisse, modern art, moma, museum of modern art, nelson rockefeller, nyc art exhibits, nyc exhibits, nyc museums, pocantico hills. Bookmark the permalink. Thank you very much for your kind note, and I’m so sorry for the oversight. I have added the credit for your lovely photo. Is there a site you’d like me to link to, as well, in case readers would like to see more of your work?